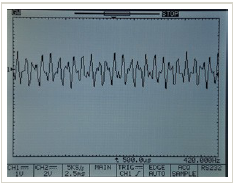 parameters of DTMF generator, audio alarm and light interface are programmed through the RS232 serial interface. 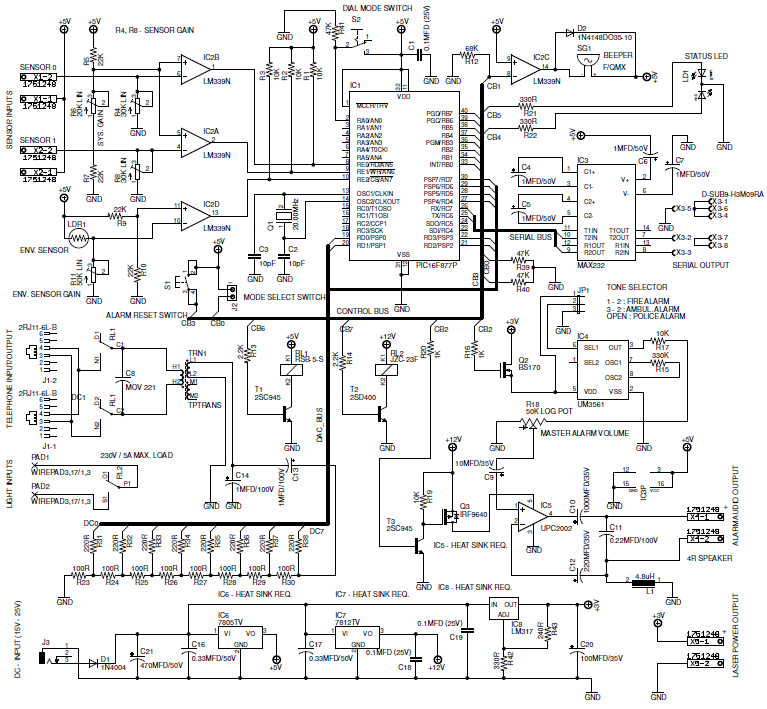 controller, LM339 as sensor interface, UM3561 as a tone generator and μPC2002 as a speaker driver (audio amplifier). 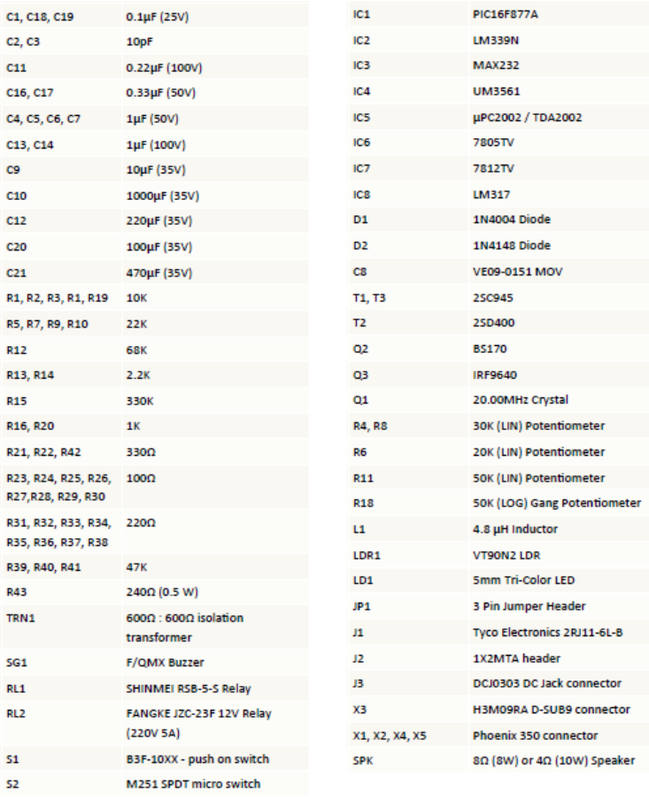 LM7805, LM7812 and LM317 voltage regulators are used to obtain +5V, +12V and +3V respectively. circuit. As shown in the fig.1 all the photoelectric sensors, some of the switches and alarm speaker are connected with the circuit through the connector bars. 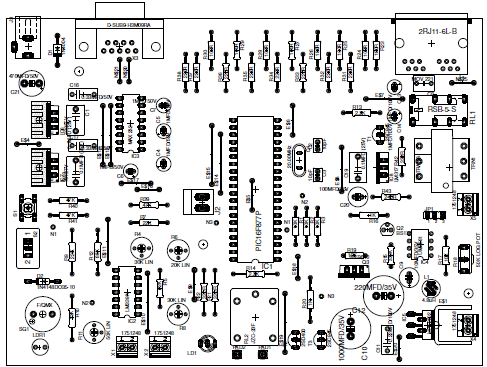 DC Power input : Attach DC power supply with 18V - 25V (2A Max.) output. RS232 Connector : Connect RS232 serial cable to the port to configure the system. Do not use RS232 Null Modem cable with this port. PHONE/LINE connector : Attach standard RJ12/RJ11 telephone cable connector to this port. One port is need to use with the phone line and remaining port is for the phone (and it is optional). 3V LASER supply : 3V supply line for LASER diode assembly. Connectors for Sensor 1/2 : Attach high sensitive LDRs for these ports. To get the maximum sensitivity it is recommended to use EG&G VACTEC LDRs. Status Indicator : Indicate run, program and sensor trigger modes. Reset Switch : Press this button to reset entire alarm system. This button enable only when the audible alarm get activated. It is not possible to use this function at the phone dialing/ringer states. Phone dialer enable switch : Turn on this switch to enable the phone dialing feature of this system. 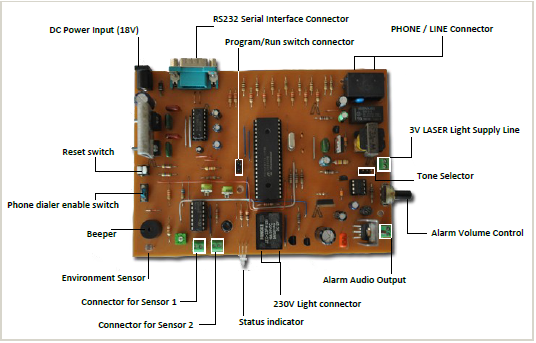 Environment Sensor : In-circuit LDR to detect light conditions of the environment. 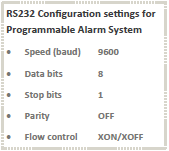 Alarm Volume Control : Use this to control the output power (volume) of the audible alarm. 230V Light connector : Attach 230V AC light (or related peripheral) to these terminals. 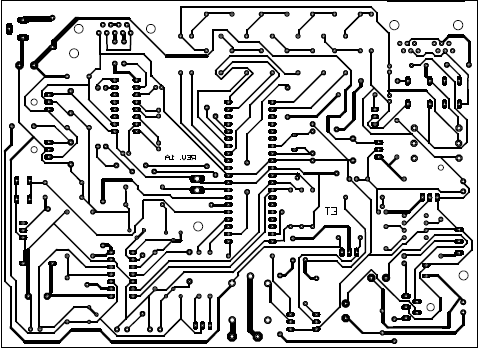 Program / Run Switch connector : Attach switch to this header to select Program or Run mode. Alarm Audio Output : Attach 8Ω (8W) or 4Ω (10W) speaker to this connector. 1. Remove IC1, IC2, IC3 and IC4 from the IC bases. 2. Apply 18V ( to 22V Max.) DC source to the power connector (J3). 3. Check the voltage between Pin12 (GND) and Pin3 of IC2. It need to be 4.8V - 5.1V DC. 4. Check the voltage between GND and E$4 jumper. It need to be 11.7V - 12.3V DC. 6. If all the above Step 3, 4 and 5 are correct, disconnect the power supply and insert IC1, IC2, IC3 and IC4 in to the appropriate IC bases. Attach suitable speaker to the X4 and connect RS232 cable to the system. 7. Close the jumper J2 (Program Mode) and power on the system. 8. Download and install PuTTY on to the target computer and setup the “Serial” connection with 9600 baud rate (see Fig. 3). 9. Press “2” and enter into the “Parameter Setup” mode. Configure all the parameter options with the appropriate settings. 10. Attach phone line to the PHONE/LINE connector and fix photoelectric LDR sensors to the X1 and X2 connectors. 11. Press “3” and execute “Self Test”. 12. Adjust R4*, R6* and R8* preset controls, if the sensors are not trigged as expected. 13. Adjust R11 preset to control the “Day” and “Night” mode detection. 14. Open the Jumper J2 and press 5 to return to the Run mode. 15. Shutdown the power supply and disconnect the RS232 cable.